The purpose of your website is to provide so much value to your website visitors that they want you to be their Realtor. It sounds so simple, but most Realtors’ websites fail to execute on providing value to the visitor. Realtors get a lot of people to visit their website. Realtors who have consistently written on their blog for a while get a lot more people to visit their website. But are the visitors getting the right message? So who are the visitors, and what exactly is the content that they reading on your website? More important, what incentive are you give these visitors to stay on the website? And what reason are you giving them to give you their contact information? Let’s assume that you have a website, and hopefully you already do. Visitors to your website start out as casual readers of your blog, your community pages, your about me page, or use your IDX to search for a property. The goal is to turn those visitors into leads by getting their contact information. When the lead gives you their contact information, it is their way of saying “I am giving you permission to talk to me, and this is how you can reach me.” Then it becomes your job to turn that very qualified lead into a client. But let’s focus on the first part where the visitor to your website is just a casual reader who found your website through Google. How does that reader get convinced to fill out a contact form and give you their information? It might be a good idea to answer that question in a context that most everyone can understand. What is the number one thing that guys are told to do on the first date with a girl they just met? Ask questions and listen. It’s the guys who talk about themselves during an entire first date who are always the ones who complain they never get second dates. Why is that? It’s because people like to talk about themselves. And the girl usually holds the power to decide if there is a second date more than the guy. Not saying guys are desperate, but guys have to prove themselves more than girls. One way to think of it is that the guy is the product, and the girl gets to decide if she wants to purchase it (i.e. agree to a second date) after the free trial (i.e. first date). In real estate, your services are the product. The lead knows that you are a Realtor, and generally knows what a Realtor does. But you want to turn that lead into a client. You want that second date. You need to assess their needs, and let them know how you are the perfect Realtor to help them with their needs. And that is done by asking them questions. Asking the lead some questions also makes the conversation about them. It makes the lead the center of the universe. You give the lead the opportunity to talk about themselves because you are good at selling your services. That’s Sales 101. Your website content should be no different. The website content should make visitors feel like your website is about them. But how? You can do this when they visit your website. It’s actually very simple. You hopefully already do this with your direct mail pieces, your slogan, in your email marketing, and other ways that you communicate with leads and market yourself. I’ll give you a hint, I have been doing it in this article you are reading. I made this article about you. I am telling a story about a practice that you can implement. Although I am speaking to a specific topic, you are reading this with the feeling that it is a problem that you already have and that I am going to help solve specifically for you. Not for every Realtor out there, but just for you. Your website has a lot of content. The content is on your blog, on your community pages, and your about me pages to name a few. This content should be directed toward the type of lead you want to target. Your “About Me” page should really be called an “About You” page. People don’t care that you grew up two towns over from where you do now, graduated from college, married your high school sweetheart, worked for 10 years before you changed careers to become a Realtor, are on the school committee, and have been a Realtor for the past 5 years. They went to your “About Me” page, because they want to learn about you, right? To a point. An “About Me” page like the one I just described shows the reader actual facts about you, but they won’t feel like you know how to help them. Readers actually want to read about themselves. How do you write a good “About Me” page? Think about the type of client that you want to work with, and tailor your “About Me” page with them in mind. Start by explaining the type of person you want to help. Then, because you grew up two towns over, you have an intimate knowledge of the area, can explain every neighborhood in great detail, have stories about the town rivalries, and know what has personally happened to each town for the past number of years. Your major in college helps you serve the reader better because of some very important and unique reason. The people in the towns you serve are so amazing that you even married one of them. The 10 years in the industry you worked in before you became a Realtor gave you some specific, important and unique set of skills to help serve your reader better. You can explain how amazing the community is because you are very active in the community that you love, and want to make the great schools even better by being part of the school committee. And your 5 years experience as a Realtor will make them comfortable that you know the transaction process extremely well, but are still growing your business and will provide amazing service to the reader. An “About Me” page written like that results in complete and total empathy for the reader. There is no website visitor who would doubt that you have the community knowledge, the real estate knowledge, and the drive to help them better than any other Realtor. Your “Community” pages are your opportunity to show your expertise in the communities you serve. People can read about the communities on Wikipedia, or the chamber of commerce website, but that provides very dry information. You are not held to the standards of Wikipedia and the chamber of commerce. How do you write good “Community” pages? Again, think about the type of clients you want to work with, and tailor your “Community” pages with them in mind. Write about the standard stuff, like the history of the communities, the areas of the communities, the schools in the communities, and what the communities are known for. That’s Wikipedia stuff. But you know more than Wikipedia. You know the best restaurants, and why the owner closed his last restaurant to open this new one. You know the best coffee shops, and the best seat if you’re working on your website. You know the most scenic jogging trails or places for a picnic. You know the parts of town that gentrified, that are gentrifying, and will probably gentrify soon. If you specialize in working with investors, you can explain the growth in property value over the past decade. You can talk about the areas that have been developed, the areas that are planned for development, and the infrastructure changes that are planned. You could explain the sections of the communities that the renters live, and the sections that they can get the best cash flow and cap rates. Your “Community” pages give you the opportunity to prove your knowledge by explaining the personalized details that can’t be found without significant amounts of research on the internet. There is no website visitor who would doubt that you have the most knowledge of the communities than any other Realtor. Your blog is where you can really provide value to your website visitors. First, you should use the tips from the explanation of your About Me and Community pages to understand the tone that your blog should be written. Now, let’s understand the type of content to write about. 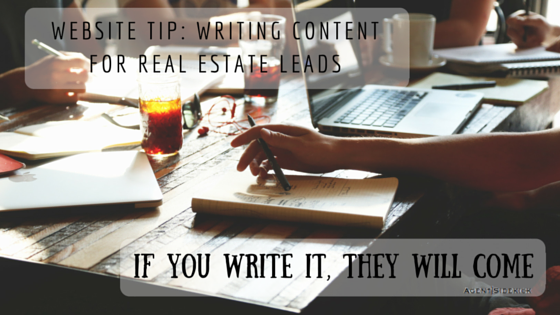 The articles in a blog should be local and real estate related as much as possible. They topics should be what your website visitors are interested in. Are your ideal website visitors really interested about “Sealing Your Windows And Doors Against Leaks”*? How about an article about “How to Choose a Perfect Grill”*? How many visitors would give any Realtor their information after reading those types of articles? And are you trying to attract the type of person who is interested in that? *Note: These are actual topics that some blog services sell to Realtors. So watch out if you decide to pay for a blog service! Your ideal clients are probably interested in the process of buying a home in your area. Or how to schedule the utilities in your town when moving. Or rental laws in your town. Or a schedule of major events the town puts on each year. Before you run out of ideas on your own, write down questions that your clients ask you. Write down questions that leads ask you when you go on listing presentations. Those questions are a goldmine of topics to write about. Why? Because if it is a question for one person, then many people probably have that same question. Many website visitors have the same questions. Over time, your blog will be an amazing resource for real estate and local knowledge. There is no website visitor who would be able to question that you are THE authority in your community over every other Realtor. Here’s the scenario – a potential lead lands on your website because they Googled something that you had written about in your blog (another reason to write about questions that your clients ask you). Because they received great value from the article, they stay and read your About Me page, and the page for the Community they are interested in. Then maybe they read a couple more blog posts that are valuable for their situation. Do you think you will get a second date with website content like we described above? In other words, do you think you gave the visitor every reason to provide you with their contact information, which is their way of asking you to call them? We think the chances would be pretty good of that happening. Sure, have a page in there that talks about your credentials, about your awards, about your certifications, about how great you are. Don’t get me wrong, that stuff is important. It’s supplemental proof when the lead wants to confirm you are as good as the service you say you can provide. But it’s not the most important thing that lets a lead know you can help with their needs. Good Realtors show that they understand their leads and are there to help. They are not the guy on the date who just talks about himself and tries to impress the girl by telling her how great he is. Rather, good Realtors are the guy on the date who asks the girl a question, then responds that they know exactly what the girl is talking about and can empathize how whatever they’re talking about made them feel. Then the good Realtor, and guy who will get a second date, asks a follow up question, and has another good response. Lather, rinse, repeat. A Realtor’s website content should do the same thing. The Realtor should state how they can help the website visitor with their real estate needs. The Realtor’s website needs to show empathy. It needs to show understanding. It needs to show execution. If you are interested in learning how Agent Sidekick can provide a website for your real estate business so that it generates leads, feel free to take our Product Tour or Contact Us to let us know.